Present Owner: The Selkirk Community Arts Centre, Inc.
Selkirk's steady growth in the late nineteenth and early twentieth centuries prompted local authorities to agitate for the construction of a public building, one that would combine all Dominion offices under one roof—fisheries, North West Mounted Police, customs and of course a post office. 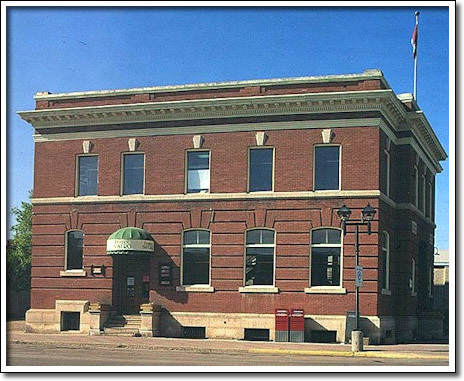 Designed by architect James Chisholm and Son of Winnipeg, working from Department of Public Works specifications, the building rose between 1907 and 1909, constructed by the Brown and Garson Construction Company. The structure is a modest expression of the then-popular Classical Revival style of architecture. The elaborate cornice, radiating voussoir window keystones and use of brick string courses are all elements of that style. Although converted into a rooming house during the 1960s, and laying vacant in recent years, the interior details and floor plans remained intact. In 1989 the building was rehabilitated to accommodate offices, an art gallery and a restaurant.